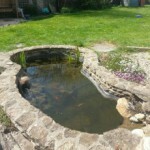 Lagoon covers are used and can reduce the odours from animal waste in slurry and dirty water lagoons. Keeping rainwater from the slurry can maximise storage potential in the 6 month period farmers must provide. With quantative rain expected to fall in various months throughout the year, valuable storage space is used unnecessarily without a lagoon cover. 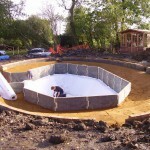 The installation of lagoon covers can dramatically increase the efficiency of a lagoon. A cover will reduce water loss through evaporation, increase overall water quality, and prevent water ingress where required. 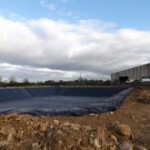 Here at Stephens Industries, we often install floating lagoon covers – an increasingly popular choice for farmers throughout the UK which enables the rise and lower of the cover according to the amount of slurry contained. Here at Stephens Industries, we like to use AquaBLOC LF and Genatex 850 as materials when creating the perfect lagoon covers. There are a number of benefits of having Stephens Industries Lagoon Covers, these include: Bespoke sizes to fit any size of slurry or dirty water lagoon, fast installation time, gas venting through special floating pillows, and prevents up to 90% of water evaporation. As the demand on water resources continue to grow the investment in a lagoon cover makes sound commercial and environmental sense. Contact our team today to find out more about our lagoon covers and options available to you or simply to discuss a project that you may have.